The K2M Bicycle Tour is a route from Kentucky to Memphis that begins on Highway 157 just north of the Tennessee/Kentucky border and ends at the Mississippi River Greenbelt Park at Harbor Town in downtown Memphis. The route is 155.5 miles in length and is intended to be a two day trip. Originally mapped and ridden by a team of 11 cyclists on March 18-19, 2012. 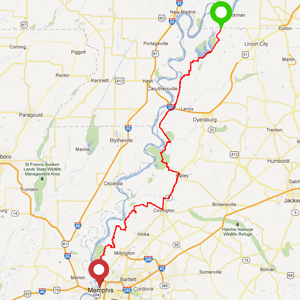 The maps, documentary video, photographs, GPS data and other information are intended to be shared with anyone interested in riding the K2M route and exploring the spectacular bicycling country of West Tennessee. Questions or comments may be directed to k2m@k2mtour.org or the K2M Facebook page. Signup for email notifications about upcoming rides and route updates. The original K2M route. Download to your GPS device or create cue sheets at the mapping website, ridewithgps.com. The alternate route to Ripley that avoids a seven mile section of gravel road in the Chickasaw Wildlife Refuge. This route may also be used if the regular route is flooded. The original route map embedded with photographs and comments about road conditions and other cycling related information.